A visual Web authoring tool, which helps you make Web Pages without having to know HTML, simply by dragging and dropping page content ! Actual Drawing is a visual Web authoring tool, which helps you make Web Pages without having to know HTML, simply by dragging and dropping page content. 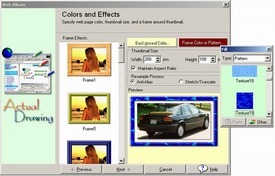 It has own image manipulation tools that you don't need to use a third party image editor. You can add a shadow to an image or to a text block, make it glow, or draw it with opacity. Additional tools allow to Flip, Rotate, Resize, Adjust Colors, Blur, Sharpen, Dilate, Erode or Emboss any image. Artistic Text --- Character-level control over all text attributes, including color, outline, and filling. It can be drawn with shadow and live effects, using any font that your computer has. Image Optimization ---To cut loading time for site visitors, the program optimizes graphic by removing extraneous material. The optimization tool has simple interface and helps quickly compare different image formats to create the smallest image. Vector Images --- Resolution-independent vector layers allow for quick creation images that can be resized without loss of quality. Built in Image effects --- Any layer can be drawn with multiple live effects. Live effects are completely editable. If you make any change to the layer, the effect automatically updates! Filling objects --- The linear, velvet, radial, conical, and square gradients and patterns enable you to create visual effects with stunning realism and help you to design tremendous animations much more easily. FTP Upload --- Actual Drawing can connects to your Web site and uploads all the page content via FTP protocol. Creating Web-based Forms --- Actual Drawing helps you to create all common used form elements such as Push Buttons, Check Boxes, Radio Buttons, Lists, Menus, Text Fields, Hidden Values etc. Floating Layers --- You can directly manipulate layers in creating Web Page; to edit the layer's properties, position, size, transparency, etc. Web Album --- The program contains various thumbnail frames to build a creative and stylish Web Album. Broken Links Check Up --- Use the Check Up Broken Links feature to search for broken links and unreferenced files in a Web page, or in an entire site. 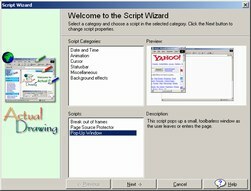 Batch Processor --- You simply select documents and add batch processing commands, such as Search and Replace Text, Links, Images, Fonts, or Change Export Properties, and the program automatically performs this commands.